Shedding or self-pruning is a natural process in which trees and shrubs minimize disease and promote vigor. This occurs when leaves, twigs and branches die, decay and detach from the living tree. Trees identify weak and dying branches and begin the shedding process by walling off the diseased limb. Rot inhibiting cells contain and separate diseased wood from healthy wood. Walled off tree parts are deprived of food and eventually wither and die. The “Containment of Disease in Trees,” or CODIT, was first discovered by Alex Shigo and is the principal behind the “New Tree Biology” employed today. Selective pruning compliments the shedding process to promote healing and renewed vigor in trees and shrubs. How Do I Decide What To Prune? 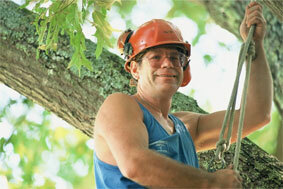 Understanding arboriculture is helpful, however, simply follow this priority of pruning and your tree will be grateful. Avoid removing more than one third of the crown mass and please do not top off branches leaving unhealthy stubs. 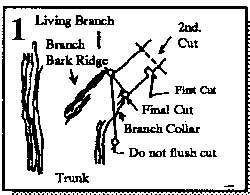 What is A Proper Pruning Cut? 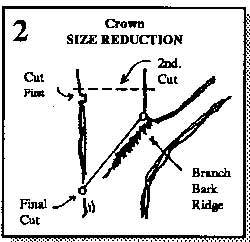 Make pruning cuts like those illustrated above. And remember when reducing tree size or heading back branches always prune back to a healthy lateral branch and avoid pruning back to a branch smaller than one third the size in diameter of the branch being removed.